It is a momentous time for the Post-Human Assembly. Having populated the Milky Way, the Great Houses turn their eyes towards a neighboring galaxy, endeavoring to venture across the inter-galactic void to stake claim among uncharted stars. Each Great House seeks dominance, for in the race to achieve hegemony only one will be victorious. 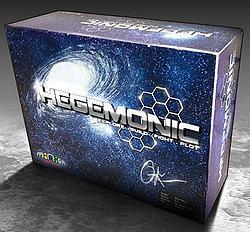 Hegemonic is a game of galactic exploration, empire building, conflict, and cunning that's playable in 30-45 minutes per player. Each player assumes the role of a Great House Leader, exploring sectors of the new galaxy; building industrial, political, and martial systems; employing far-reaching technologies; and performing calculated actions to leverage their power. The game scales from 2-6 players and uses a modular board system to create a balanced and highly replayable experience. Players exercise their power through industrial expansion, political leverage, and military force using a simultaneous action selection mechanism. The game proceeds over a number of turns until the galaxy is fully explored. Each turn consists of an exploration phase followed by three action phases and an arbitration phase. All players move through each phase collectively, resulting in a fast-paced and engaging gameplay experience. During the exploration phase, all players simultaneously collect income, then explore sectors of the galaxy by drafting sector tiles from a pool and adding them to the galaxy boards. Last, players discover new technologies by managing a hand of Resolution/Technology cards. Players must carefully guide the exploration of the galaxy to their own advantage while minimizing the benefits to their opponents. During each of the three action phases per turn, players secretly select one of seven action cards allowing them to expand their industrial, political, and martial capabilities; sabotaging, subverting, and blocking their opponent’s efforts through conflict; or conducting further discoveries. All players reveal their action cards simultaneously, which are then resolved in a particular order, determined by the action card number and player order. Players must carefully sequence their own actions while anticipating their opponent's moves to fully execute their plans. In the arbitration phase, players position themselves to become the Arbiter for the next turn, allowing them to manipulate player order and the action sequence to their advantage. Additionally, excess wealth and income is absorbed by their empire, with larger empires consuming more resources, forcing players to balance the growth and power of their empire with a sustainable resource flow. Each player balances his hand of dual-purpose Resolution/Technology cards, which are used to influence success in conflict or can be played as a permanent technology benefit for his empire. Players must decide carefully how and when to use these cards as there is a tradeoff between saving high power cards for their resolution power and using them for their technological advantages. These dual-purpose cards ensure that each one can serve a strategic purpose in expanding a player's reign while greatly mitigating the luck of the draw. Players accumulate VPs at the end of each turn based on the relative control they have over each galaxy region. The game ends when the galaxy is fully explored by having a sector tile placed on every galaxy board location, typically 5 to 6 turns. Final bonus scoring includes points for total power and technology advancement. This scoring mechanism forces critical decisions throughout the game as you must continually balance the amount of power your bases provide and its location relative to other players. The player able to extend their power and influence the most strategically across the galaxy will establish the new dominant hegemony and win the game!